This is where is all started. The original light up love letters. The Classic! 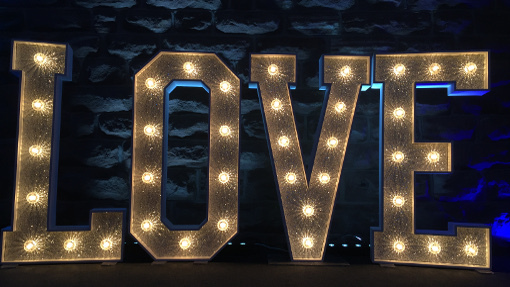 Our most popular product the classic golf ball bulb ‘LOVE.’ Each letter stands at 4ft by 2ft, painted matt white and has a beautiful vintage feel. These bulbs feature an exposed filament making them beautiful, bright and bold. 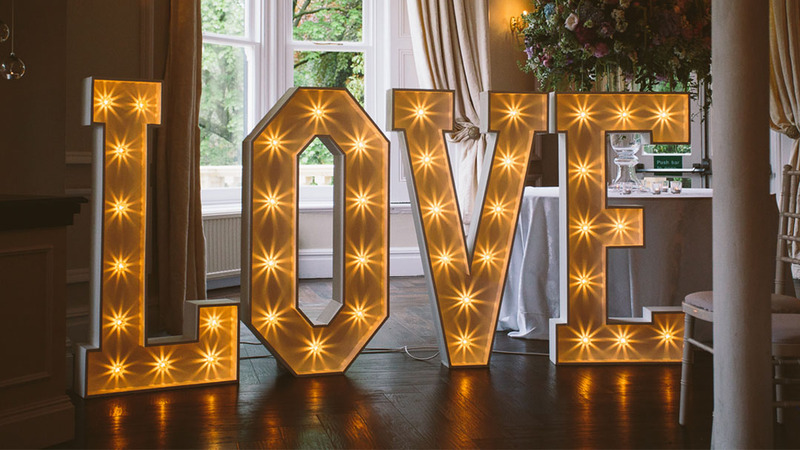 The Classic light up Love letters are certainly a main attraction. Each letter has an individual plug so can be spread as wide as you like. We provide the extension cable so only require the one plug socket from your venue. The classic LOVE is where it all began, designed exclusively by us (for our wedding!) these are the original style! With the option of hiring a dimmer switch (check out our accessories page) to customise your lighting for the evening atmosphere! White Matt Finish to define the classic look, font designed by The Word is Love team. Each ‘Golf Ball’ Bulb in the classic is 15 Watts. An optional dimmer can be added to your order to achieve a gentle glow in the evening. We supply spare bulbs as standard should they be needed. Each letter is independently powered allowing freedom to position them anywhere in the room. If the word is complete then we supply extensions (where required) so only one power socket is needed. Please contact us for chat about your individual requirements. We’d love to hear your plans! The Classic just got Sparkled! 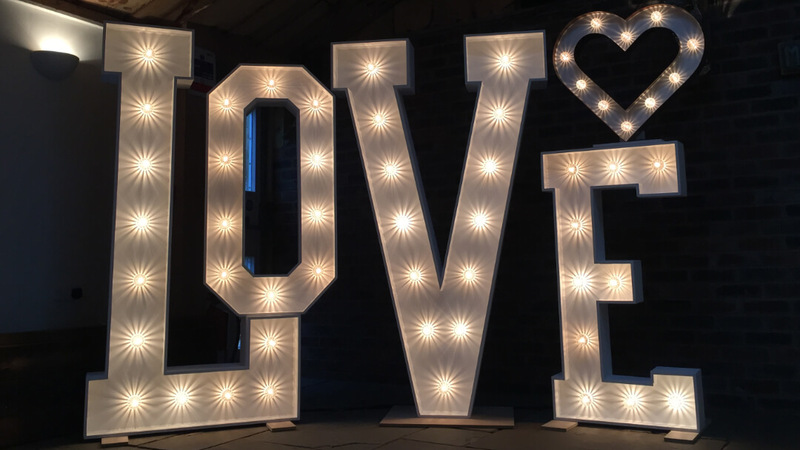 You have the choice when hiring the Classic 4ft light up LOVE letters to change the bulbs, from classic golf ball to Sparkle! These give a softer glow and a sparkle effect on the white background. Think old style fairground rides! The beauty of the sparkle bulb is you are able to change the colour to match the theme of your wedding or event. If you’ve got an eye for detail then the Sparkle bulbs are definitely for you! They are available in: Pink, Purple, Clear, Matt White and Red, Blue, Green & Yellow. SPARKLE are available in: Pink, Purple, Clear, Matt White and Red, Blue, Green & Yellow. Rose Gold and Silver Glitter Light Up LOVE Letters! GLITTER LOVE is available in: Rose Gold and Silver Glitter. Our fun Mix & Match is perfectly quirky! Mix and match was born from putting away both 4 ft and 6 ft letters from the weekends events! It’s fun and different and creates something that hasn’t been seen before. Only available in Sparkle these love letters include a rustic heart on the ‘E’ to complete the look. The Classic + vintage = The Rustic! We absolutely LOVE our new collection of Rustic reclaimed timber products. 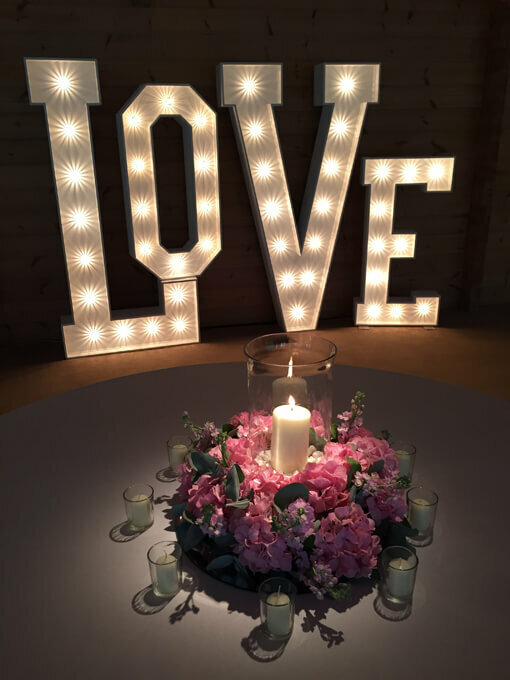 Our classic style light up LOVE letters have been transformed into these unique Rustic pieces making them perfect for Barn, Tipi & Outdoor weddings. 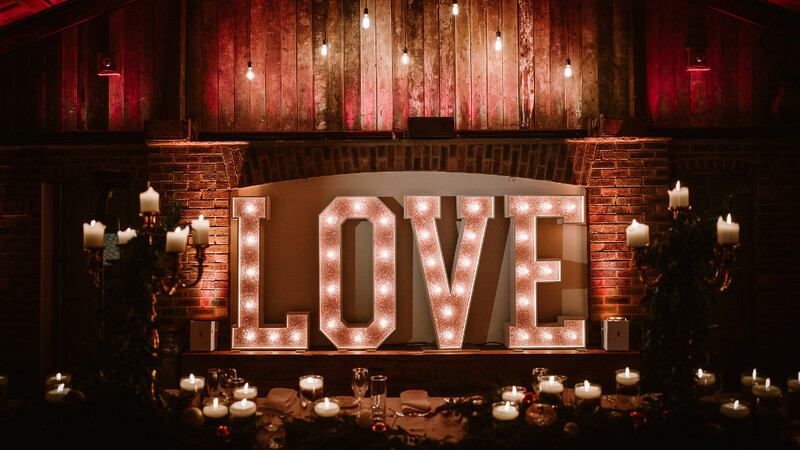 Our Rustic Love letters are safe to use outdoors, being waterproof sealed around the festoon bulbs. 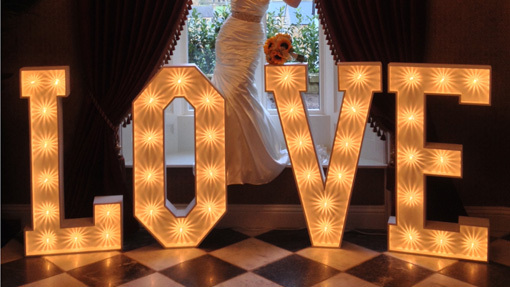 The wooden love letters are the same style, font and height as our classic letters just with an edgy vintage twist! Vintage Wooden look, font designed by The Word is Love team. The Rustic festoon bulbs are waterproof sealed and safe to use outdoors. Each bulbs is 15 Watts. 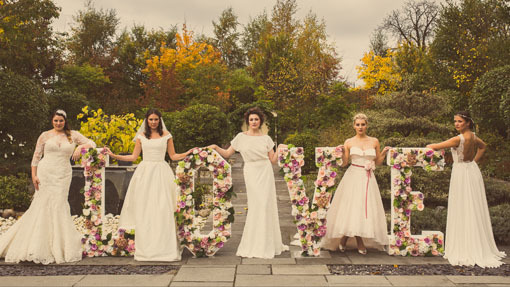 Our Classic ‘LOVE’ Letters just a whole lot bigger! 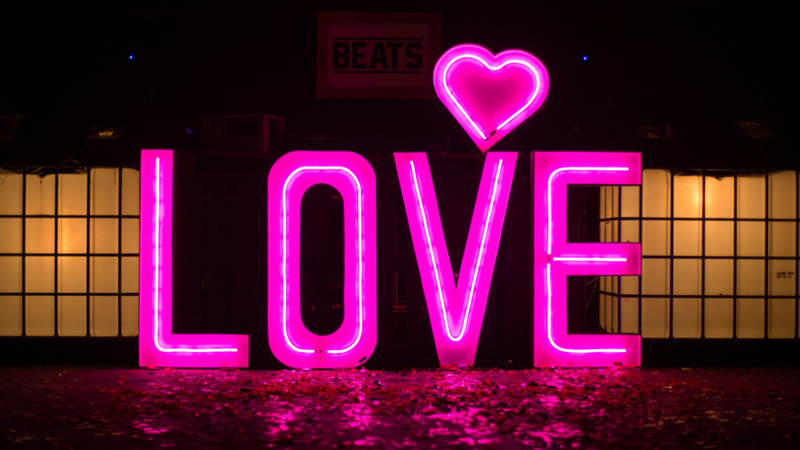 Our supersized 6 Foot giant Light up LOVE letters really make a statement. Each letter stands a massive 6ft high x 3ft wide! Available only in Sparkle Bulb they are perfect for lighting up darker spaces, filling big venues and open spaces and as the perfect back drop to your day. Especially your First Dance! If you want impact then the Supersize giant love letters are just the ticket. 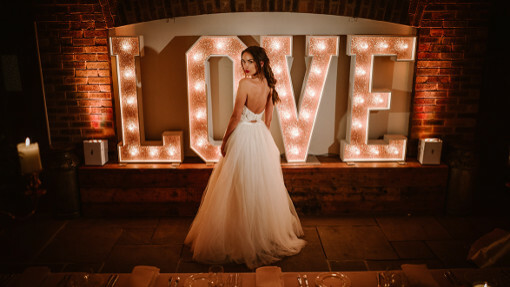 We also offer the option to ‘Mix & Match’ our regular 4ft LOVE letters with the 6ft SUPERSIZE and finished with our light up Heart Accessory for a fun, quirky look. Our classic Matt White finish, font designed by The Word is Love team. The Supersize is only available in Sparkle Bulbs for big impact. The sublimely pretty floral LOVE letters are the same height as our classic except filled with the highest quality faux flowers giving a simply beautiful effect. Our Vintage Pretty in Pastel LOVE is styled and complete with Austin Roses, Garden roses, Peonies and Hydrangeas this unique LOVE feature will be certain to compliment any budding bride! The romantic blush colours are enough to make any heart melt! Just when you thought your choice of flower wasn’t in season we go and produce this beautiful flower LOVE. 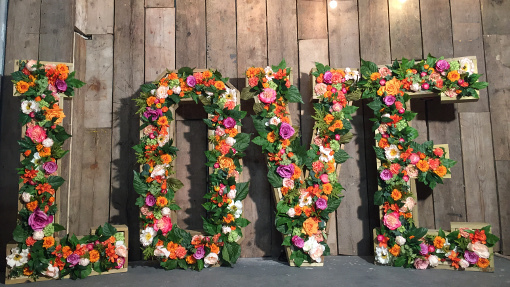 Our Second Bright and Bold Orange Flowers with Lots of Green Foliage is placed within our RUSTIC Wooden LOVE letters. Including a lot of Marigolds in Orange, Roses and Orange Yellow and Pink Ranunculas. It stands out and is spectacular in real life!! Power is not required for Floral LOVE making them incredibly versatile. Our classic Matt White finish, font designed by The Word is Love team filled with the finest faux Roses, Peonies & Hydrangeas. Power is not required for this product making them extremely versatile. 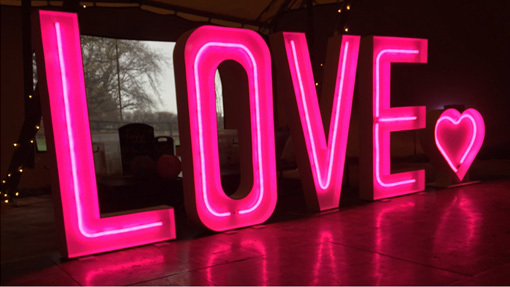 This one off NEON light up LOVE letters is specially made in 4ft x 2ft letters and styled with our simplified ‘TWIL’ font. Made from Neon Flex (which is indistinguishable from the real thing shhh!) has absolutely no chance of breaking when in transport to and from your event! Available only in Pink Neon that just looks incredible when the light goes down and really gives the a fun, vibrant touch of 80’s LA glamour! Our classic Matt White finish, simplified font designed by The Word is Love team and lit with NEONflex technology. There are none. It’s magic. Ok, not really. It’s actually a special NEON effect LED strip light so there’s no chance of damage or bulbs blowing.